UpgradeMe has been... well... Upgraded! If you are already a user of this addon and know how to set up outfits, you can skip to the “What's New” section below. If you are new to this addon, the following information will get you up and running. 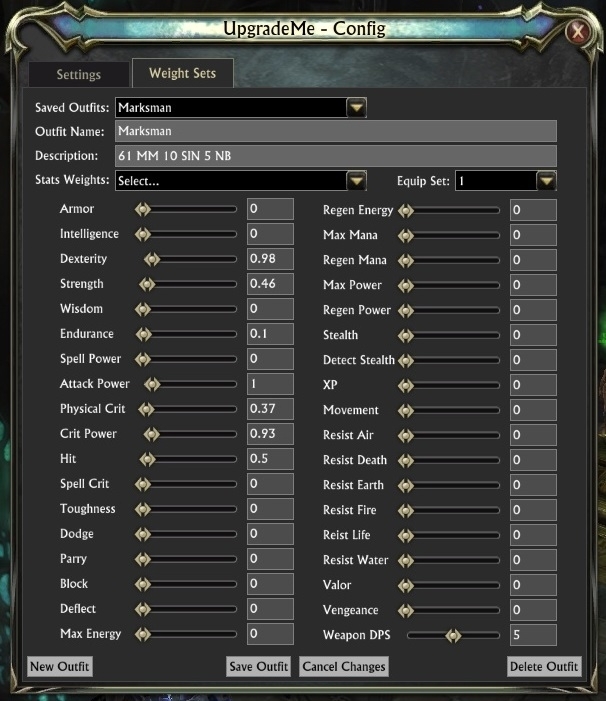 UpgradeMe is a simple addon that allows a user to create stat-weight sets and then compare current gear values to those of new drops. This addon will tell you if an item is in fact an upgrade and by how much. 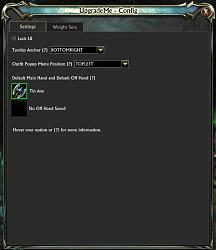 This addon makes use of other's hard work and efforts by using their theory crafting numbers. These are numbers that have been calculated based on builds and callings. Don't worry if what I said sounded foreign to you, I have tried to make this addon as simple to use as possible, yet powerful enough to allow you to adapt it to your own personal needs. 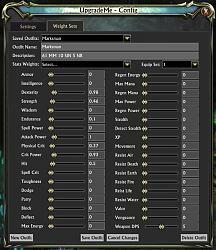 There are several premade stat-weights already loaded into the addon, however the values are infinitely customizable. All stats are available and as long as you set a value > 0, the addon will include it in the scoring system. I would like to thank Archyface for all the mage and rogue weights, Rain for the warrior weights, and Bowler Hat for the cleric weights. Again, all the hard work and effort these individuals put in to make these weights available to us, should not go unnoticed. I truly appreciate it. That being said, if you want to increase/decrease or add another stat to a premade set, there is no issue. Just adjust the needed stat and select save. You have just created your own gear/weight set. To access the config panel, type /upme or double click the UpgradeMe minimap icon. UpgradeMe uses the concept of outfits. An UpgradeMe outfit is a set of gear for a particular soul build plus the stat-weights for that build. For example, a cleric's tanking gear and stat-weight is much different from their healing outfit DPS outfit. Likewise for other callings. Equip the outfit you want to set up. Type /upme to launch the config panel or double click the UpgradeMe minimap icon. The config panel will have several selections, but can be as simple as using the top five data entry points. Saved Outfits: this dropdown box should be empty as you have no saved outfits yet. Outfit Name: enter the name of the outfit in the text field area. Example: Healing, or ChloroHeals. Stat Weights: this dropdown has a list of premade stat weights compiled from Archyface (mage and rogue), Rain (warrior), and Bowler Hat (cleric). Simply select one and it will populate the sliders. If you don't see your exact build there, pick a build that is similar. If the builds are way off, then I don't have the stat-weight's for that particular build. If you could provide the numbers, I would be more than happy to include it in the next build. Also, if you don't see the set you need, you can manually set up the weights using the sliders below. Once you select your set, you may change any or all values to suit your liking. Just be aware that these numbers come from hours of calculations and have been vetted and deemed to be true. New – Equip Set: this dropdown contains numbers 0 through 20. This will tie the UpgradeMe outfit to an equipset being used in rift. If you currently use /saveequip or /loadequip, this number corresponds to the equipment slot used. If you don't use these macros, select any number 1 to 20, but make sure you don't duplicate if you create multiple sets (i.e. don't select 1 for your tank and 1 for your healing because that will confuse you and the addon). Once done, click the Save Outfit button. This will save the stat weights and outfit pieces you are currently wearing. Change your gear to your next set and repeat step from step 1 for as many sets as you want. So if I'm a cleric, I would put on all my healing gear set up my healing set and click save. Then I would equip my DPS gear and set up my DPS set and click save. Then equip my tank gear and set up my tank set and click save. If you have more than one DPS, healing, or tank spec, don't worry. Just set up as many sets as you would like. After creating your outfit sets, just close the config panel and the addon will do the rest. Anytime you hover over gear, the addon will display its tooltip letting you know if it is an upgrade or not and for what outfit sets. Unfortunately linking items does not trigger this addon as it is not considered a tooltip by the UI. However, auction house, inspecting other players, dungeon/raid/world drops, etc will all produce a tooltip. Tooltips are tied to calling. So if plate drops and you are a cloth wearer, the addon will not trigger. The tooltip will have the name of the outfit and then associated scores for the new item in the following format (100/90) + 10. Where 100 is the new item score, 90 is the current item score, and +10 is the upgrade score. Rings - Rings will produce a different tooltip. It will rate each ring and tell you if it is an upgrade or not. Two Handed Weapons - Will be compared to main hand and off hand making it easier to see if it is an upgrade or not. NEW: One Handed Drops – will use default main hand and default off hand to calculate UpgradeMe values. Items without any stats will show as a side grade regardless of if it is better or not. So you must use your own judgment for your spec (trinkets). Rune's are not used in calculation. The addon assumes that if you have a rune on your current piece, it will be the same rune on the new piece. Left click on outfit in UpgradeMe's interface to equip gear, equip the new drop, then right click the outfit in UpgradeMe's interface (you must have a unique equip set selected for this to work properly – see #7 above). The tooltip has been upgraded to make it even easier to read. Text is color coded along with the icon to notify you immediately if something is an upgrade or not. The tooltip may now be detached from Rift's tooltip. This will allow for functionality when other addons that use tooltips are loaded (i.e. BananAH, and Imhothar's Bag's). This is not an issue with either of these addons, nor is it an issue with UpgradeMe, it is unfortunately due to the way Rift's UI handles the tooltip and the tooltip API. This is simply a work around until a more robust API is released. Default main hand and default off hand. This was introduced in order to allow two handed users to quickly identify a one handed drop as an upgrade. To do this, you will need to determine what you want to use as a default main hand and a default off hand. You can do this by inspecting other players, seeing the drop in game, or going to the AH (if it is BoE). To save an item as a default main hand, simply hold down your left mouse button before you hover over the item. For default off hand, hold down the right. Also, if a one handed item drops and you do not have default items selected, the tooltip will notify you. Minimap icon and UpgradeMe user interface. Now each outfit set you create will appear in a popup menu when you hover over the minimap icon. If you use the equip set functionality you may now equip gear by left clicking and save gear by right clicking. You can also double click this icon to open/close the config panel. Config Panel now has a “Settings Tab” that will allow you to configure the user interface. If the UI is unlock, the mouse wheel can be used to scale the size of the minimap button. 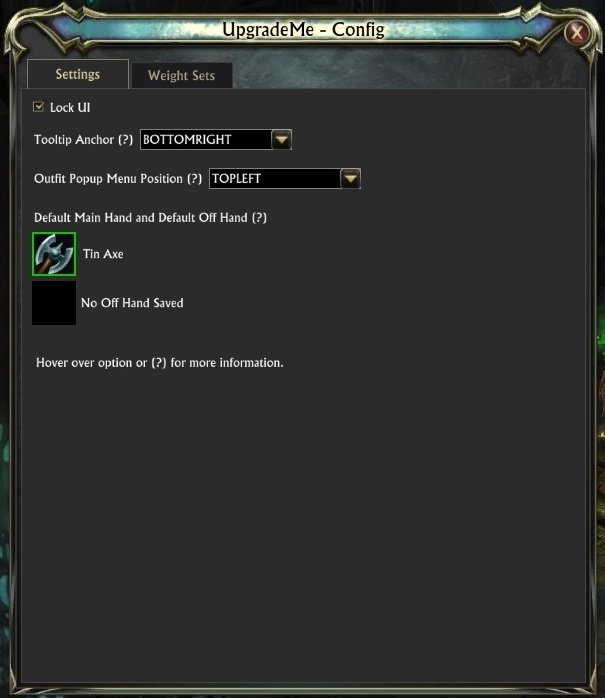 The tooltip anchor can be tied to the Rift tooltip or to the new tooltip anchor frame. You can select which direction the popup displays and see what items are selected as your default main hand and default off hand. Tooltip will display what outfit set a current item belongs too. Using the functionality of the new wardrobe macros to allow appearance changes when switching sets. The Hammerfist Clan Gaming Community and their community manager Brakkish for putting up with me and continuously testing my stupid ideas for addons. The HFC Rift Team and it's officers, it is people like you that keep me gaming. You guys are awesome! Special thanks to a few specific people that really pushed me to get this done: [email protected] and [email protected] you guys rock! Another big thank you to Archyface, Rain, and Bowler Hat. Without their hard work and efforts, this addon wouldn't exist. Thank you to all the users who have downloaded and used UpgradeMe. I hope I've made it better and look forward to your comments and suggestions. I hope you enjoy and if you have an suggestions or feedback, please don't hesitate to drop me a note. * Fixed bug where butchering items would be compared to rings. * Fixed dual wielding calculations. Main hand/Off hand will now correctly calculate for rogue and warriors. * Fixed bug that would sometimes throw an error when drawing UI in combat. * Added Docker functionality. By default, this functionality is turned off. Open config and select "Use Docker" checkbox. When changing settings it will require a /reloadui to take effect. * New user interface for easy swapping/saving gear/stats. * Default main/off hand item functionality. * New and improved tooltip. * Fixed a bug introduced with 1.0.5 where weapon dps was not being calculated correctly. My apologies for not catching this sooner. * Added outfit validation to the tooltip. Now when your current gear does not match that of a saved set, the tooltip will prompt you with "Current Outfit Conflict" in the tooltip. Everything will work fine, but it will remind you that you've equipped an upgrade, but forgot to save it to a particular set. * Updated addon scope. Thank you Imhothar for pointing it out and walking me through it. * Updated config panel with tabs. New info tab will automatically display on build updates. Panel will only display if one of your calling's builds was edited. It will only display the first time logging in, but will be available via the Info tab on the config panel. * Fixed bug where sometimes an error would be thrown mousing over non-equipment items. ** Noticed that test data made it into release. Values were corrected. ** NOTICE: If you were using one of the premade mage stat sets, please open the config panel, select your outfit, then reselect the stats and click save again. This will update your sets with the correct values. I apologize for this inconvenience. ** Fixed issue when manually entering values it would sometime throw an error. ** Seems like patch 2.2 changed code values for tab and enter keys. I changed those too. An import/export option via code-generation would be handy to share weight sets for certain specs via forum or other means of communication. Great idea atesy! Looking at the way the number crunchers are approaching specs, I will need to rework that area anyway. This will definitely be added to the list. Hi. This is an incredibly useful Addon for me, thanks very much for creating it! I just got a neck item I already had, and noticed the Addon gives it a substantially lower score. I believe this is due to the Dream Orb on my existing item. Is it possible for the Addon to ignore Orbs like it ignores Runes? Very cool addon. Can you implement stat cap targets? As in, player enters an integer for a stat target they want to reach, and any points in that stat higher than the cap are counted as 0 weight? maybe even a visual indicator on tooltip that alerts a player if that gear would put them over a cap. I started wanting to use caps, but I'm not sure how useful they would be in Rift. The Rift itemization seems to take care of caps for the most part. However, I'll take a look and see how feasible it is for me at this time. Thanks for the nudge and thanks for using the addon. Is there anyway to get it to compare the Lesser and Greater focuses? it would be nice to have since, since it already does the gear i would think it could do them as well. Unfortunately Nat, I don't think the API (the programming interface behind the scenes) allows access to that information at this time. I'll continue to look into it, and will implement it once it is available. oh ok. I had assumed it was just comparing against the equipped set. Will most likely be the issue. Thanks. How about making it only compare with the best item found in equipped/inventory/bank? This is how Pawn works for WoW, and works like a charm. I'm getting lazy with the whole /upme, /saveequip everytime I find a upgrade as well :/. Is it possible for UpgradeMe to use /equipset as its comparison? It would make it much easier to have accurate upgrade recommendations instead of having to open /upme every time we change a gear piece. Aalwein, I agree 100%. I am working on getting the addon ready for the new event system behind the scenes. This is on my radar, but not sure how to handle it. Right now we can't trigger off a /saveequip so the addon wont know when it has changed. I don't have access to that information/data through the addon API. Now I can add a UI to the addon that allows you to /saveequip and /equipset, but either way it will be a hassle. If you have any ideas, I'm all ears. I'll continue to think about it and hopefully will come up with a good solution. I might look to see if I can gain access to equipset through player storage, but I don't think I can. We'll see. Noticed today that in many cases the tooltips are not working. Highlighting an equipped item often compares it to something not considered equal. Many items are compared against zero regardless of the item that is equipped in that slot. Unsure of some calculations that seem to be off. Had an item that was something like +2 dex and the score was much larger than it should be. 1) Open config and select your gear set from the very first drop down. If it's not there that might be your problem. 2) Once you select your gear set, equip all the gear you want saved to that set. 3) Click the save button. Once you do that, try it again and see if that fixes it. If it doesn't please let me know what class and level you are and what item you are trying to get the tip to show up on. Sorry for the problem, but we'll get you fixed up.